I'll be honest with you: I only knew two things about , prior to this year. For one, I knew it had a large Mormon population. And secondly, I associated it as one of the “gateways” to Zion National Park, since it's less than an hour away. So when St. George's tourism board invited me to visit, my interest was piqued. I've done enough traveling to know that every city, no matter its size, has something interesting to it. Not to mention that the American Southwest is my favorite part of the US. Saying yes to that invite was a no-brainer. And what did I find in St. George? 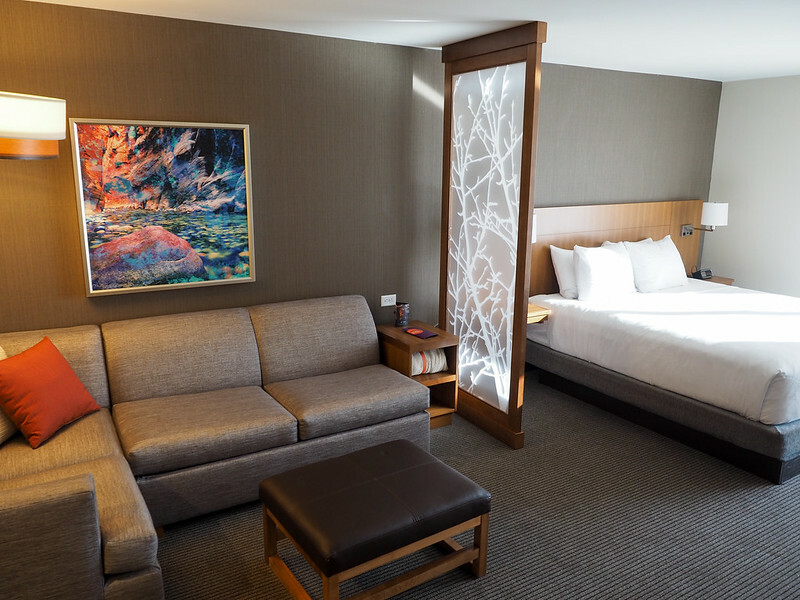 Well, as the title of this post should suggest, I found a city that's much more than just a place to stay before you visit Zion National Park. I had a great time in St. George. The city, sitting at the bottom of those iconic Southwestern red hills, is visually pleasing. The people were SO friendly. And even in mid-December the weather was sunny and mild. I spent 4 days in and around St. George, which is plenty of time to get to cover all its highlights. Located at the entrance to Pioneer Park (which appears in the next section of this post), the Red Hills Desert Garden is a 5-acre garden filled with thousands of cool desert plants, most of which are labeled so you know what you're looking at. It's a neat place to wander through for half an hour or so, and the best part is that it's free to visit! Utah is one of those US states that's basically a paleontologist's dream; lots of dinosaur fossils have been found all across the state. 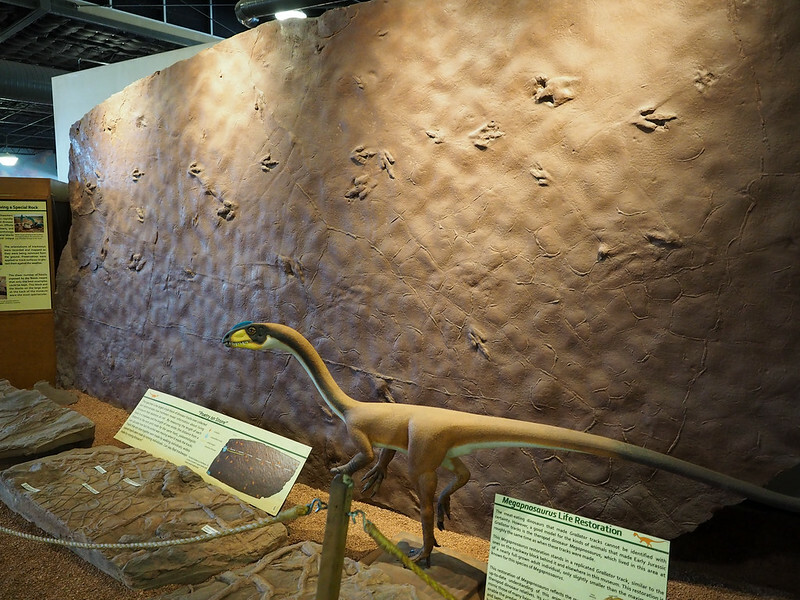 And around St. George, you can see some great examples of preserved dinosaur footprints. The bet place to start is the , where you can see tons of (real) fossilized dino footprints. The small museum sits on the site of a prehistoric lake, and the star is definitely a huge preserved dinosaur trackway and several large, detailed fossilized footprints. This site is easy to access and kid-friendly. The largest in-tact dinosaur trackway ever collected. OR, if you want to see some dinosaur tracks “in the wild,” there are two sites near St. George where you can hike to see fossilized dino tracks. One is the in Washington, UT, and the other is the site near Hurricane, UT. 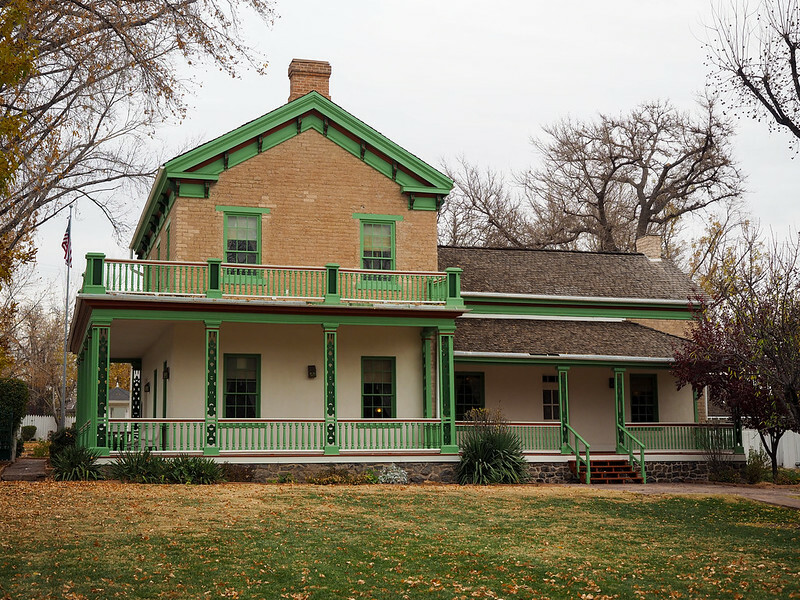 If you're interested in learning more about the Mormon church in Utah, consider a free tour of the Brigham Young Winter Home and Office in central St. George. Young led The Church of Jesus Christ of Latter-day Saints for 30 years, and more or less brought the Mormons to Utah. He wintered in this house for the last few years of his life, and the museum-house is decorated as it would have been when Young lived there. Pioneer Park is a 52-acre free community park up in the red hills above St. George. The park is basically a giant playground – but we're not talking swing sets and slides here. The red rocks themselves are the playground, and you're encouraged to hike and climb in them. I don't think I'll ever get tired of these red rocks! I spent a fun morning here exploring little slot canyons and climbing up to a tiny arch overlooking the whole park. Want even MORE impressive scenery? Then you need to spend at least a day in Snow Canyon State Park, located about a 20-minute drive from St. George. Here you'll find scenery that wouldn't look out of place in Zion National Park: red cliffs, white mountains, and plenty of epic views. I visited Snow Canyon on a weekday in mid-December, and hardly saw any other people on the hiking trails. I hit up short and easy trails to Jenny's Canyon and the Whiterocks Amphitheater, and climbed up on the petrified sand dunes for sunset. This was one of my favorite days in St. George! And the best part? Entry only costs $6 per car. 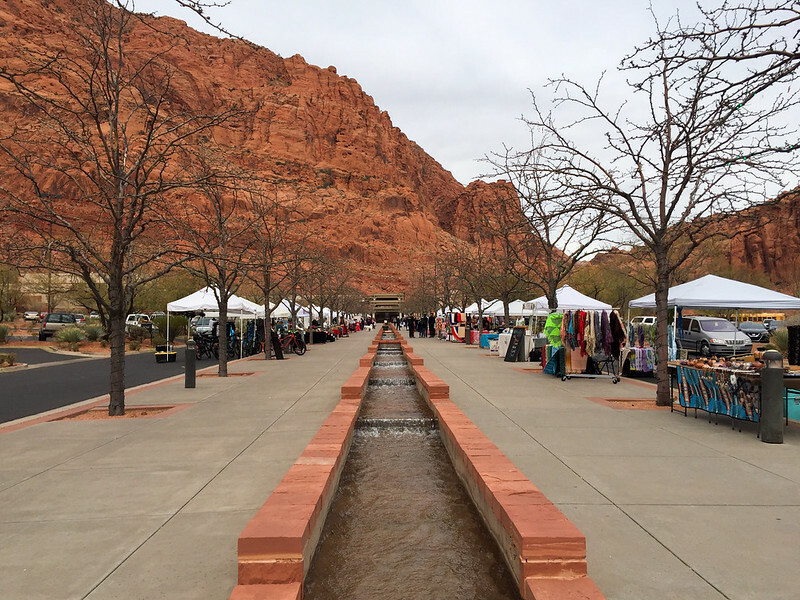 Every Saturday, vendors set up outside The Tuacahn Center for the Arts, an amphitheater near Snow Canyon State park in Ivins, Utah. Vendors are mostly local artists and craftspeople, making this a great spot to pick up a unique souvenir or gift. If you're looking for more art (or if you aren't in town on a Saturday), you can also check out the nearby Kayenta Art Village or Coyote Gulch Art Village. I'm definitely *not* a foodie – I don't travel with food in mind, and generally don't write food guides about the places I visit. But this wouldn't really be a “see, do & eat” guide if I didn't list some of my St. George favorites! Black Bear Diner – If you're looking for a cozy, rustic spot with super-nice staff, head to the Black Bear Diner. They serve up American comfort food, including all-day breakfast! Riggatti's Pizza – Located on Main Street in St. George's cute downtown area, Riggatti's is an unpretentious spot serving up delicious wood-fired pizza. If you go for lunch, they have a special of a personal-sized pizza and drink. Cliffside Restaurant – For a more upscale meal, you can't beat the Cliffside Restaurant, with its sweeping views out over St. George. The food is delicious, and the portion sizes actually are finish-able. You'll need reservations on weekends, or be willing to sit outside on the patio. Or, if you're looking for a luxurious getaway, check out the in St. George, or the in nearby Ivins. 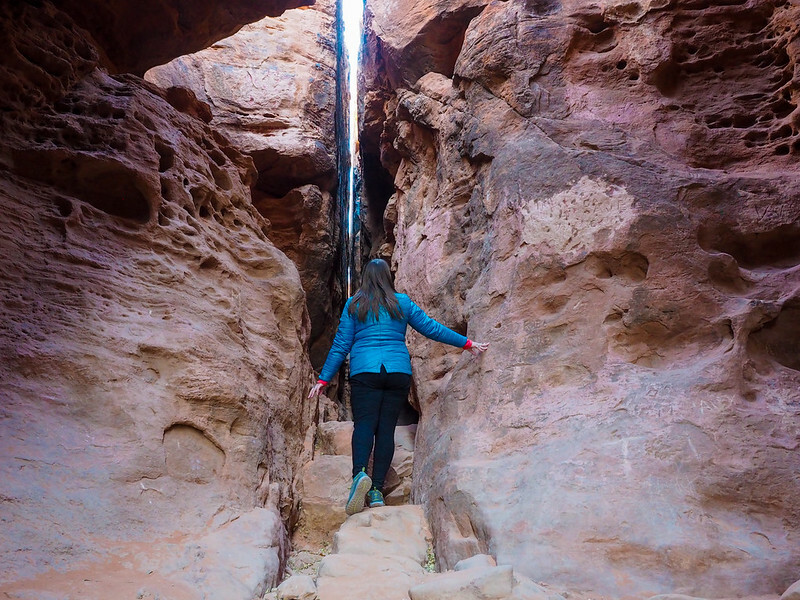 Even though a lot of people just pass through St. George on the way to Utah's national parks, hopefully this post has convinced you that St. George is more than just a gateway to Zion. You can easily use St. George as your base for exploring nearby parks, yes, but I'd advise you to spend a couple days exploring St. George itself, too! Have you ever been to St. George? If not, is it somewhere you'd like to visit now? *Note: I was a guest of during my time in the city. As always, though, all opinions and recommendations are 100% my own! Dude I’ve been to St. George so many times. I live in Las Vegas (although I’m living in Germany currently), and St. George has been kind of a base camp for checking out all those nearby places you mentioned. Zion, Bryce, etc. And I worked at the Grand Canyon North Rim for a summer too, and St. George was the closest major town we could go to to buy some stuff we needed. That being said however, despite the fact that I’ve probably spent several weeks of my life in that town, I know no more about it than those two facts you stated at the beginning XD What an oversight! I never even thought about visiting it as a destination in itself. Thank you for the recommendation! It’s not a big city by any means, but there’s certainly enough to do there to fill up a weekend! Gorgeous photos! Seeing the footprints of dinosaurs make me realise how I haven’t thought about the fact that these enormous animals have roamed the earth before us for a long time! Oh man I love dinosaurs! One of these years I’d love to go on a paleontological dig somewhere out west! I love to read your post and everything you wrote in your blog Akatuki.Definitely Utah is amazing and to much to see.I am regionally from New Zealand and lived here for the last 32 years and I still haven’t been to many of the sides.Besides traveling to other countries such as Norway,Russia etc.There are heaps of major attractions and like wise the little but magnificent places here in the State of Utah.It’s all about money and time.Thank you for all the great writings and photos.Have a great new year and a prosperity life style in 2018. I’ve never heard of St. George, except in reference to St. George and the dragon, and of course, our (England) patron saint lol! However, I have been to Utah, and it’s quite beautiful. We went in January, and it was still glorious! I was surprised by how nice the weather was in December – but then I found out that St. George tends to have mild, sunny weather for most of the winter! The landscapes in Utah are simply stunning! Those landscapes and pictures are beautiful!! I want to hike this place soon. It’s a nice little city – I would definitely stay there again if I’m spending some time in the Southwest! I’m so glad you made it to Snow Canyon! That and Sand Hollow are my favorite locals’ spots out near St. George. I’m actually going back next month for my third year in a row—can’t get enough of Zion! Hope to finally hike the Narrows as it was canceled on my last two summer visits due to flooding. Snow Canyon was amazing! I love Zion and all, but even going in December the national park was pretty busy. Meanwhile Snow Canyon was basically empty! If I had to pick a favorite state in the US based on landscapes alone, it would definitely be Utah! Perfect timing! We’ll be heading here in March and are super excited to explore. Awesome! Hopefully you’ve gotten a few good suggestions from this post! I can’t believe with all our trips in and across the USA, we’ve still not made it to Utah, which looks like a photography paradise. Will have to remedy that in the near future, and when we do, this post will come in very handy! I can’t believe that, either! It really is a dream for landscape photographers – there’s SO much good stuff to see! We LOVE this place, people are friendly, great places to eat, fantastic canyons to see, and gorgeous homes for sale here!!! So sorry to hear about your house in Hawaii, Dennis. But I’m glad to hear you’ve found a new spot to love in St. George! Этот популярный интернет-сайт с информацией про https://avtokum.com/.